Hardscapes & Patios - Contact Our Fort Collins Landscapers Today! | Advanced Landscaping & Sprinklers, Inc.
At Advanced Landscaping & Sprinklers, Inc., we take pride in helping Fort Collins homeowners create beautiful landscapes and maintain their homes. From irrigation installations to snow removal, we offer a variety of year-round landscaping services that make it easy and affordable to create the home you’ve always wanted. Read on to learn more about hardscaping and patios, and give us a call at 970-316-2983 or send us an email through our website to request a free quote! If you don’t see the hardscape feature you’re looking for, then get in touch with a member of our staff to request more information about hardscaping in Fort Collins! 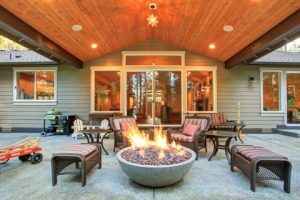 Functionality: Maybe you’re looking to add a place where you can read in the mornings, or perhaps you want to make your home the go-to gathering spot by adding a fire pit. No matter what you choose to do, we know that you won’t regret investing in a patio installation. When you choose to install a patio, your backyard instantly becomes a beautiful space you can use throughout the year. You can add lighting, furniture, and the grill you’ve always wanted to really make the space your own. Curb appeal: The words “curb appeal” can be somewhat misleading, as they can give the impression that the front of your home is the only part of your home that needs to be appealing when you put it on the market. First impressions are important, but you want your home to be impressive all the way through. While your landscape and decor will certainly boost your home’s curb appeal, a patio installation and impressive hardscape features in the backyard will make your home truly memorable. Home value: Adding a patio and hardscape features are great ways to improve your home’s overall resale value. Should you choose to sell your home in a few months or in a few years, you can add high-quality photos of your new patio and hardscape features to the listing. Advanced Landscaping & Sprinklers, Inc. proudly provides patio and hardscape installations in Fort Collins. We would love to help you bring your design ideas to life, so please give us a call today to request a quote!